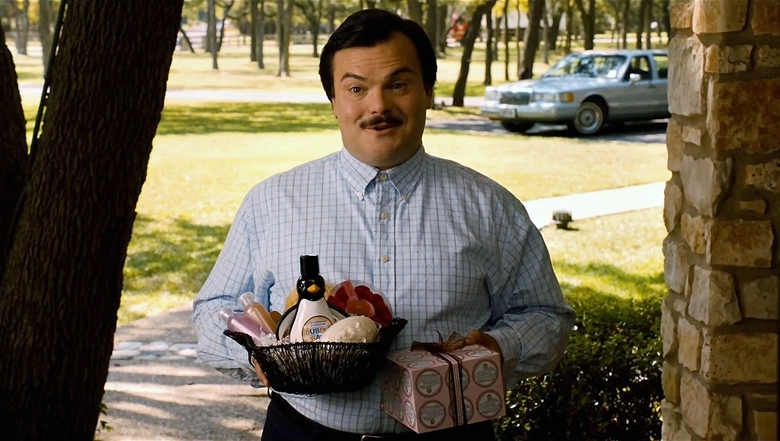 Given that director Richard Linklater managed to draw out Jack Black’s finest lead outing in 2003’s School of Rock, it should come as no surprise to find that he’s done it once again ten years later in this bizarre tale of small town shenanigans. That’s handy, for given the story on offer here, there’s plenty of room for surprise in this dark, comic delight. Black plays local undertaker Bernie Tiede; the kind of man adored by the townsfolk for his kind ways and commitment to community. So when he strikes up an unlikely relationship with Shirley MacLaine’s witch-like widow Marjorie he raises a few eyebrows. When she disappears one day though the people of Carthage, Texas refuse to accept the local D.A’s (Matthew McConaughey) story and course of action. The fact that Bernie stems from a remarkable true story – and article written by screenwriter Skip Hollandsworth – means that Linklater’s documentary-style fits this story’s telling well. So, aside from several fictionalised scenes, presumably wrestled from the actual Tiede’s memory, we’re treated to a first half arranged around sequences of lively talking heads. While the locals outpouring of affection for Bernie and bile towards Marjorie suits the storyline, Linklater’s decision to cast Black as the lead is both the film’s trump card and biggest issue. While he’s undeniably impressive as the compassionate Bernie, his very presence suggests a more comic tone than perhaps the true nature of the material deserves. Which means that it’s actually a relief, once it becomes clear just what’s going to happen to both Bernie and Marjorie, that Matthew McConaughey’s swashbuckling D.A turns up to nab most of the chuckles. Sporting an ill-fitting grey suit, oversized Deirdre Barlow specs and terribly parted wig, he’s miles away from the shirtless wonder we’ve grown used to and clearly enjoying himself once more in this current resurgence of his career. So while he, Black and MacLaine are on top form, the fact that Bernie feels, for the most part, like a documentary – and with good reason – means that for every giggle there’s a nagging sense of guilt. However, when it’s done with such aplomb, that feeling soon moves on.